This tour is also available as Small Group Tour (max 8 people) and as a Private Tour. The minimum age is 7 (25 kg) and the maximum weight limit is 120 kg. Ability to swim is essential. During June, July, and August, our start time is every day at 10:45 a.m. and 8:00 a.m. on Mondays, Wednesdays, and Fridays. In September, our start time is 9:45 a.m. Private tours are welcome, please contact us for further information. All of our tours meet at the monument in Plaza Antonio Lopez (unless otherwise stated) at the bottom of the Gothic Quarter. We take a private bus up the coast towards France. It’s about 1 hour and 15 minutes through the Catalonian valleys. Please arrive 10 minutes before your tour is scheduled to begin. The tour will be divided into groups of maximum 12 people. We allow more people in private groups. What should you bring? We suggest water and some snacks (lunch is after the activity), sunscreen lotion, swimwear, and a towel. Water shoes are optional, but not necessary. At the beginning and end of the season, we also suggest an extra layer or blanket. We have a storeroom on the beach where you can keep all your belongings while kayaking. 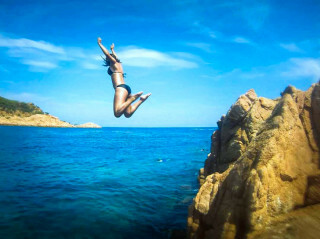 The sea can be quite fresh at the beginning and end of summer (May and September). 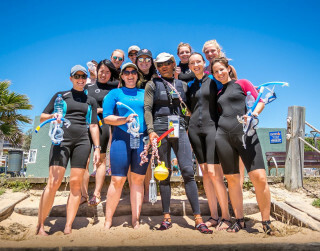 We will provide you with neoprene wetsuits, but they don’t cover the lower leg and arms. 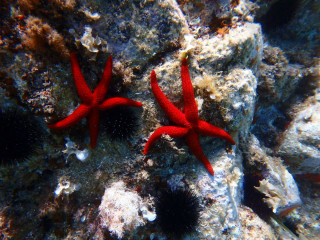 If you feel too cold in the sea, we will concentrate more on kayaking than snorkeling. As the tour will take a full day, we will have a late lunch after the activity (around 2:30 p.m.), so we suggest you have a nice breakfast and bring some snacks. You can also buy food and drinks in the restaurant on the spot. They sell bottles of water, although it’s cheaper to buy water before joining us on the tour in Barcelona. We don’t provide fins for snorkeling. Fins can cause (and have caused) damage to the environment if you are not an experienced snorkeler. However, feel free to bring your own fins along if you have them. We may need to cancel the tour due to bad weather and unsafe sea conditions. All our guides are qualified professionals who put your health and safety first, so please understand that when a tour is canceled, it is for your safety. Our guides always decide which is the best and safest route to take, where it is possible to snorkel, or if you can visit the caves. Please respect their decisions as they are extremely knowledgeable of the area. 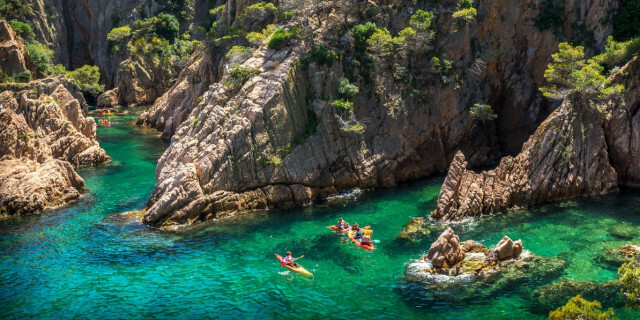 Discover the wild terrain of Costa Brava in this one-day tour of exploration perfect for friends and families. 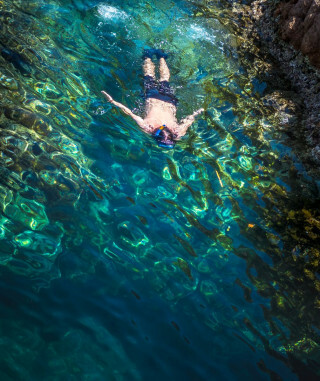 Swim in crystalline waters, paddle past rugged cliffs, snorkel with sea life, and much more. Our tour begins in the morning in the center of Barcelona. By private coach, we travel a little over an hour to a scenic beach as pretty as a postcard. 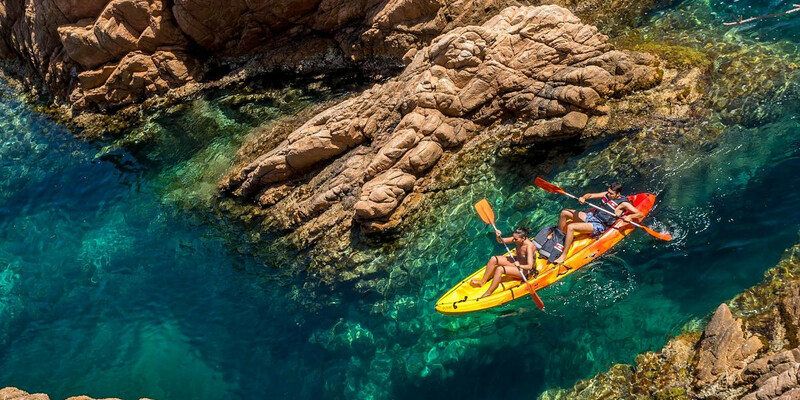 From here, our professional guide navigates you through some of the Mediterranean’s most crystal clear waters to remote places only accessible by kayak. 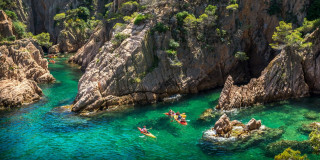 As this part of Costa Brava is a marine reserve, the guide has much to tell you about the exotic landscape’s flora, fauna, and history. 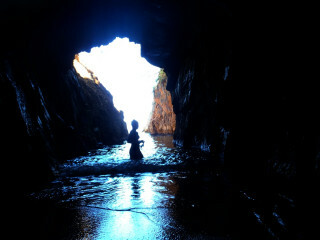 Surrounded by high sea cliffs and pine forests, you instantly feel the charm of Spain’s natural beauty. 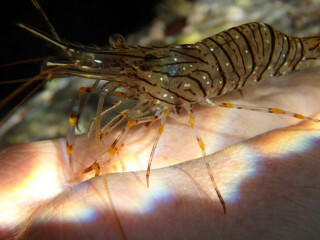 During the day, the super transparent seas are waiting for you to jump in to explore their coves and reefs. 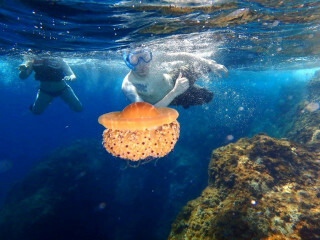 Snorkel with the bustling underwater wildlife, such as octopus, moray eels, and fish of all colors. After the day of paddling, both kayakers and walkers enjoy a tasty lunch and some relaxing on a sandy beach. You can float in the waves or jump from the scenic rocks about 2 m high. 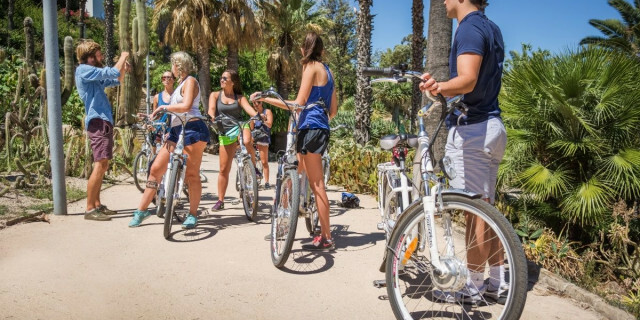 We head back in the late afternoon, arriving in Barcelona around 7:00 p.m.
With equal amounts adventure and relaxation, this family-friendly trip strikes the perfect balance to add to your holiday. 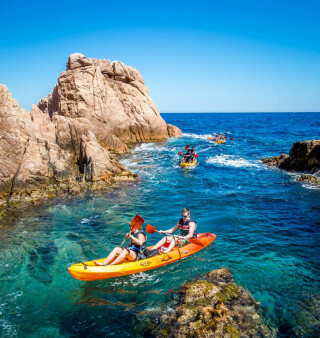 The exotic marine reserve, the fun of kayaking, and the time-out on the water make this trip through Costa Brava an experience to remember.